Elemental ~ Jewelry With Substance: Planning A Petite Wedding?? Let me apologize for the long post, but I have a ton of petite newness to show off this week--so let's get down to business! This is a classic ELEMENTAL jewelry set--The Petite Chloe Pendant & Earrings--which is available in petite as well as "biggie" size. The long pendant changes texture between gold & silver, and there are 3 stone sets from which to choose. These first two photos show the "Neutrals" set, with Opal, Black Tourmaline, Silver Abalone, and Tortoise Shell stones. Also shown in these photos is the new Petite Engagement & Wedding Rings set from PETITE ELEMENTAL JEWELRY. I've been working on these for some time now, and I'm very excited to finally have them ready for release! Shown here is the Yellow Gold Engraved set, but you can also get a non-engraved version as well as Antique Gold, White Gold, or Black Gold. The diamond changes tint--Classic Diamond, Ice Diamond, Pink, Blue, Green, & Gold Diamond. And, you can adjust the glow, shine, full bright, and transparency for various effects. 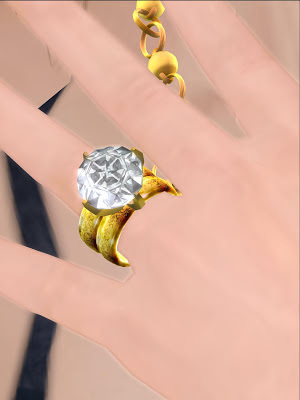 The rings are resizable for a perfect petite fit. There are also plain unisex wedding bands available--engraved or plain--which are texture changing between the various gold colors. Each set has a bonus--A "Show Ring" pose, because you just have to show your friends, right?! Back to the Chloe jewelry--Below is the "Lights" set, with a lovely Blue Lace Agate, Rose Quartz, Lavender Amethyst, or Green Turquoise. There is also a "Darks" set (not shown) with a dark blue Tanzanite, dark Amethyst, green Tsavorite, and Garnet stone. That's all folks! Jewelry: PETITE ELEMENTAL JEWELRY--Chloe Pendant & Earrings, texture changing in 3 color sets, Lights, Darks, or Neutrals. Also available for standard size avatars at ELEMENTAL JEWELRY. Rings: PETITE ELEMENTAL JEWELRY--Petite Engagement & Wedding Ring Set in yellow gold engraved. Avatar: Yabusaka Mynerva petite mesh avatar. Purchased full price. I just love this beautiful little avi so much that I can't seem to trade off to another petite shape and skin, even though there are many lovely ones now available. This is just petite me. Dress: Sn@tch --Sinister Nymph. Purchased on sale. Location: Kastle Rock Petites on Fairyland sim.